Apparently I’m very impressionable. Someone mentioned fudge to me the other day, so I just had to try my hand at making some. 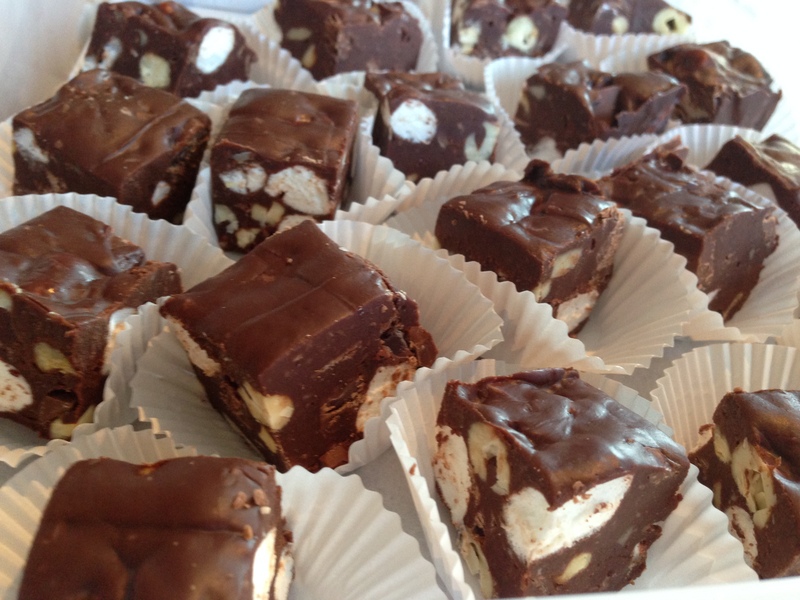 This is a “cheater” rocky road fudge (chocolate, marshmallows, and cashews) recipe as you don’t need to use a candy thermometer, and very little candy making experience/skill is needed. I doubt anyone will complain though. Line an 8-inch-square baking pan (I like the straight sided kind) with foil, leaving about a 1-inch overhang on two sides. Lightly grease the bottom and sides of the foil. Put the chocolate and butter in a large heatproof bowl and melt in the microwave or on top of simmering water. Remove the bowl from the heat and sprinkle the cocoa powder and salt over the top. Add the condensed milk and vanilla and stir with a heatproof spatula just until well blended and smooth. If the fudge feels hot to the touch, set aside, stirring frequently, 1 to 2 minutes. Adding the rocky road ingredients to a too-warm fudge would melt them. Add the marshmallows, chocolate chips, and peanuts [I used cashews] and mix briefly until blended. Scrape into the prepared pan and spread evenly. Refrigerate until chilled and firm, about 6 hours or up to 2 days [My fudge hardened enough to cut after 3-4 hours]. Use the foil “handles” to lift the fudge from the pan. Carefully peel or tear away the foil and toss it out; set the fudge on a cutting board. Using a ruler (or by eye) and a large knife, cut the fudge crosswise into 4 equal strips and then cut each strip into 8 pieces. Cover and stow in the refrigerator for up to 5 days. Serve slightly chilled.